Ask any girl about her favorite handbag essentials, and you are bound to get lip balms on the list. These handy products are excellent for keeping your lips hydrated when you are on the go. With the variety of tinted lip balms that have flooded the market recently, these are also a brilliant alternative for lipsticks on days you don’t want to apply makeup. 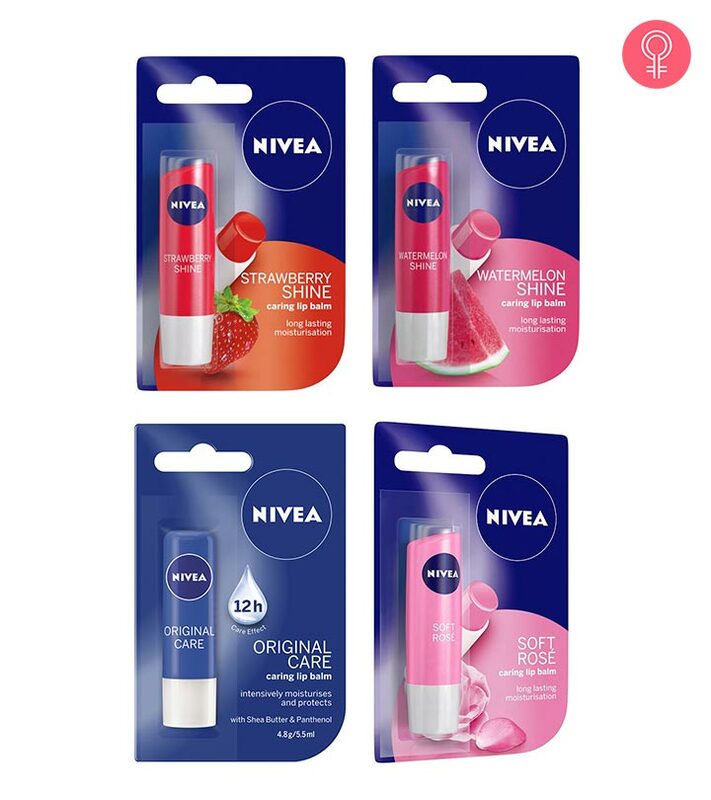 Check out this list of the best lip balms from Nivea for a soft and supple pout! 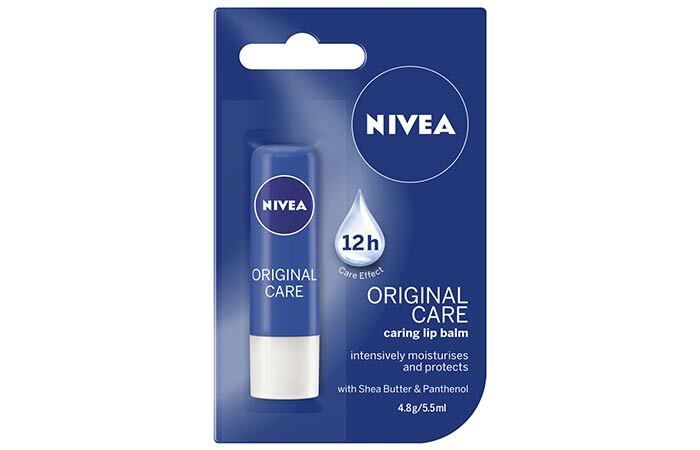 Nivea Original Care Caring Lip Balm moisturizes your lips and keeps them hydrated for up to 12 hours. It contains the original Nivea formula in a weightless texture, with no color. It prevents moisture loss and protects your lips from drying out. It is enriched with shea butter and panthenol to keep your lips nourished all day long. Regular use of this lip balm leaves your lips feeling soft and smooth. 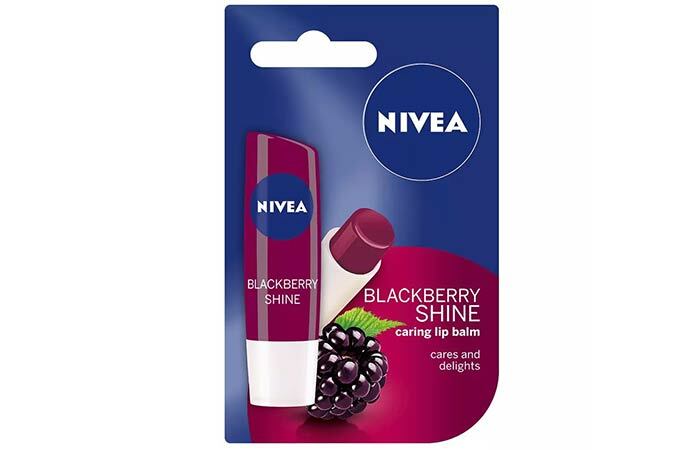 Nivea Blackberry Berry Shine Caring Lip Balm is infused with a delightful blackberry aroma. It contains pigments that leave a touch of alluring berry color on your lips. It goes on your lips with a fabulous shimmer and soft glossy color. This lip balm from Nivea has an innovative formula with Hydra IQ, which gives your lips long-lasting moisture. The travel-friendly size is easy to carry and apply anytime your lips need color and hydration. 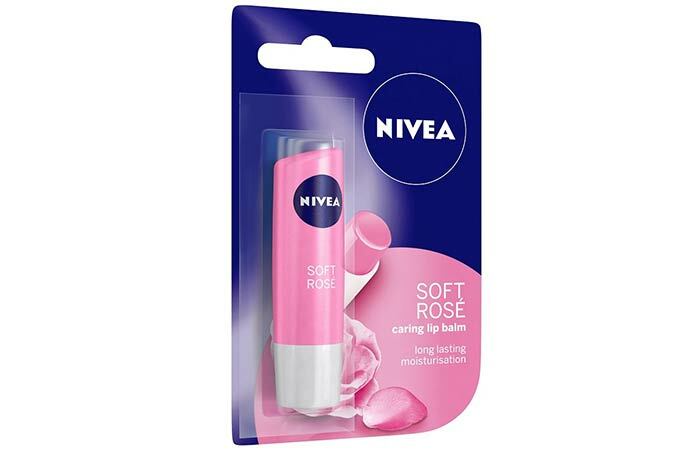 Nivea Soft Rose Caring Lip Balm highlights the natural rosiness of your lips. It is enriched with precious rose extracts and jojoba oil that pamper your lips with moisture, keeping them soft and smooth. It also leaves a subtle rose shine on your lips. Its pleasant fragrance is a mood-lifter, and the SPF 10 in it offers your lips good sun protection each time you step outdoors. 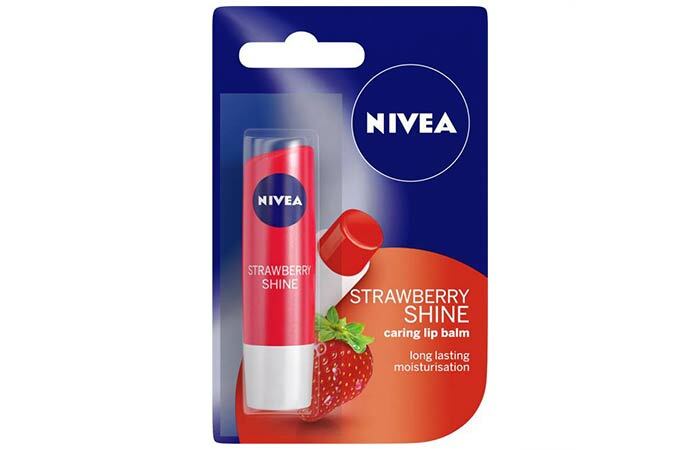 Nivea Strawberry Shine Caring Lip Balm gives you long-lasting moisturization. It is enriched with the delightful aroma of strawberries and contains carefully chosen pigments that impart a hint of color to your lips. This travel-friendly lip balm is also easy on your pocket, so you can enjoy affordable lip care even when you are on the go. It is no wonder that this lip balm is a favorite across women of all age groups. 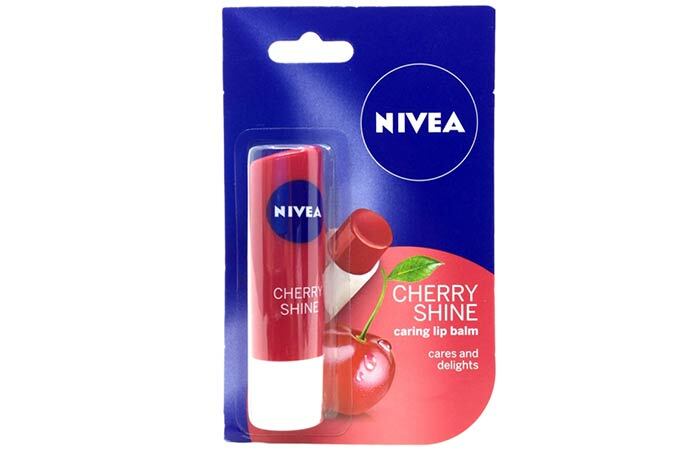 Pamper your lips with Nivea Cherry Shine Caring Lip Balm. It gives your lips long-lasting hydration as well as a delightful cherry fragrance. What makes it even more appealing is that it contains pigments that leave your lips with a very alluring touch of color. It fits comfortably in most purses, so you can carry it along to give your lips a pop of color anytime, anywhere! 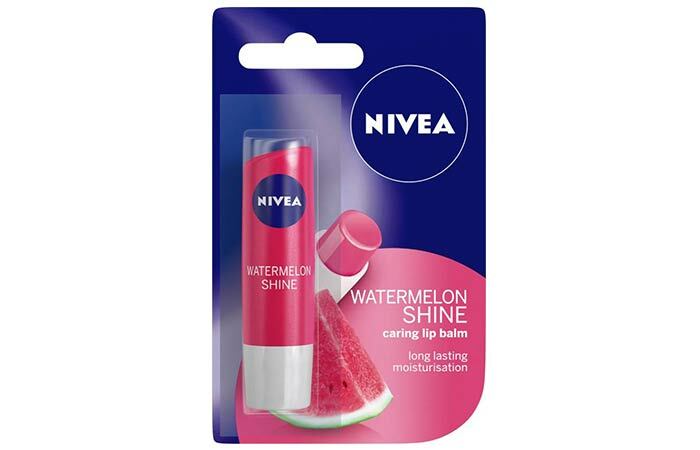 Nivea Watermelon Shine Caring Lip Balm comes with an innovative formula containing the Hydra IQ complex that nourishes dry lips with long-lasting moisture. It contains watermelon fruit extracts and bright pigments that lend a delicious fruity fragrance and soft glossy sheen to your lips. While this lip balm does not protect against sun damage, its affordable pricing and travel-friendly size are enough to give it a permanent spot in your handbag! Nivea Peach Shine Caring Lip Balm delights your lips with its delicious fruity aroma, fabulous shimmer, and soft glossy color. Use it daily to pamper your lips with its gentle care and get soft and smooth lips. Its innovative formula with Hydra IQ offers long-lasting moisturization. The combination of peach flavor and pigments provides a tempting fragrance while leaving a hint of delicate peach color on your soft and smooth lips. 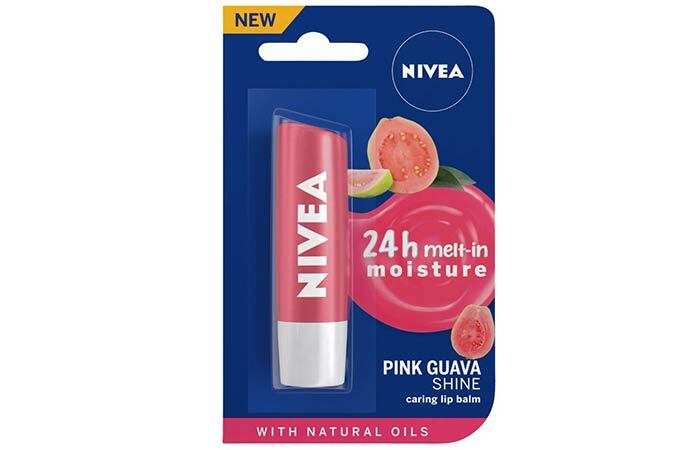 Pamper your lips with a delicious pink guava aroma and subtle pink shine using the Nivea Pink Guava Shine Caring Lip Balm. This unique formula is enriched with shimmery pigments that instantly melt into your lips and keep them moisturized for up to 24 hours. The natural oils in it give you soft, kissable lips all day long. It glides on evenly, making it easy to touch up your lips even when you are on the go! 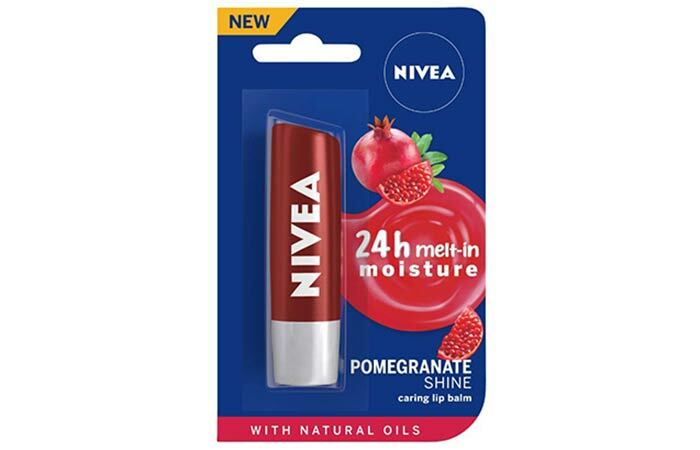 Nivea Pomegranate Shine Caring Lip Balm perks up your lips and your mood with a delicious pomegranate aroma and dark red color. Its unique formula is enriched with shimmery pigments and instantly melts into your lips to keep them moisturized for up to 24 hours. It glides on evenly and quickly, so you don’t need a mirror to apply it. The natural oils in this formula give your pout a soft and kissable feel! These are the best nourishing lip balms offered by Nivea. You can use them any time, summer or winter, to keep your lips hydrated. Which of these will you pick up? Let us know in the comments section below.